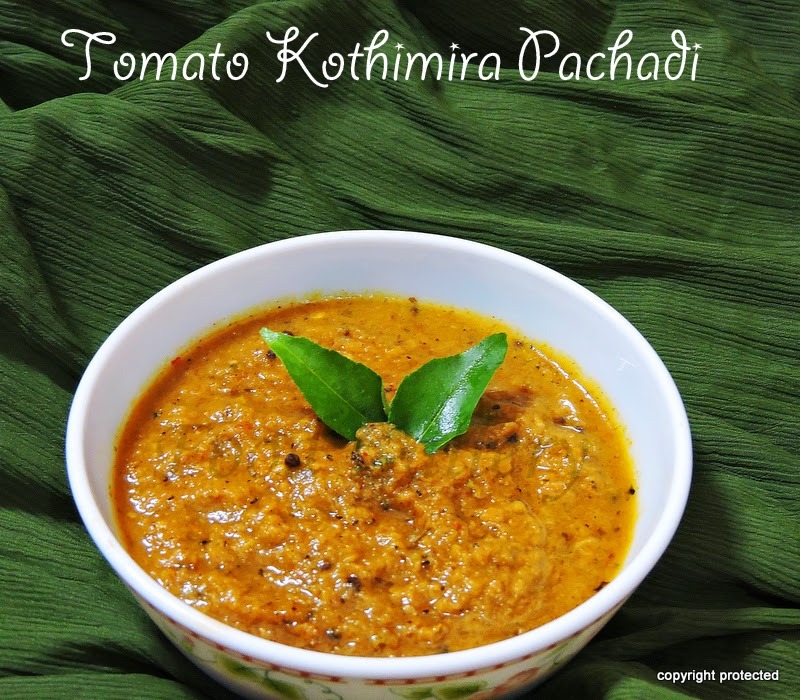 Tomato-Kothimeera Pachadi/ Thakkali Kothamalli Chutney - A simple yet flavorful chutney that tastes awesome with any breakfast dish, especially idli, dosa, pesarattu. It is tangy and wee bit sweet and tastes best when eaten fresh or the same day. If you are looking for more chutney recipes, then do check peanut chutney, tomato chutney, mint and coconut chutney, onion chutney, garlic chutney and coconut chutney. Dice onions into medium-sized squares. Heat 2 tsp of oil in a kadai, saute red chillies for a few seconds and remove onto a plate. In the same kadai, add onions and saute until onions turn transparent and remove. Add whole tomatoes (do not cut them) and fry till they turn soft on all sides and the skin of the tomatoes change color (do not burn them). Remove onto a plate and let them cool down and then cut them into medium-sized pieces. Grind all together along with coriander leaves and salt into a coarse paste. Heat the remaining oil in the kadai and add mustard seeds. When they splutter, add curry leaves and then the ground paste and cook until oil separates from it. Delicious chutney is now ready. Enjoy with idli, dosa or adai. Thanks for sharing not so general Tomato chutney with us because it is the different method from which I follow.